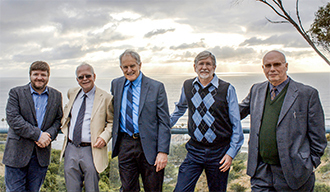 National University hosted a special event this spring for five of its College of Letters and Sciences (COLS) faculty who have recently published books on topics ranging from the origins of the warfare state to theories of learning. COLS professors honored from L-R: Colin Dickey, Ph.D.; Leslie “Tom” Pollard, Ph.D.; Carl Boggs, Ph.D.; B. Charles Tatum, Ph.D.; Igor Ya Subbotin, Ph.D.
Dr. Richardson hosted the event, which included a special dinner, to honor the authors at the Birch Aquarium in La Jolla on Tuesday, May 9. The dinner was attended by Dean Richardson and her department chairs, as well as National University Provost, Dr. Gangaram Singh.